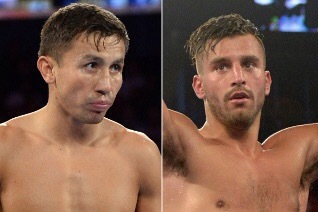 Boxing superstar, WBA, IBO and WBC “Interim” Middleweight Champion GENNADY “GGG” GOLOVKIN (33-0, 30 KOs) will face IBF Middleweight title holder, Montreal power-puncher DAVID LEMIEUX (34-2, 31 KOs), in a World Middleweight Championship Title Unification bout on Saturday, October 17 at the Mecca of Boxing, Madison Square Garden. The championship event will be produced and distributed live by HBO Pay-Per-View beginning at 9:00 p.m. ET/6:00 p.m. PT. Golovkin’s willingness to fight at destinations in both the U.S. and Europe has enabled him to emerge as one of the most marketable television attractions worldwide, setting venue attendance records and delivering tremendous TV ratings. He is currently ranked number three by ESPN.com on their Pound For Pound list with Ring Magazine also placing him at number 4. Currently ranked in the top 10 middleweight fighters by the IBF, WBO, and WBA and the reigning IBF World Middleweight Champion, David Lemieux is coming off of his ninth consecutive win over Hassan N’Dam and seventh consecutive knockout against Gabriel “King” Rosado last December. The 26-year-old Lemieux was victorious in dominant fashion capturing the vacant IBF Middleweight Title against Hassan N’Dam on June 20 in his hometown of Montreal, Canada. Dropping N’Dam four times, the hard-hitting Canadian won a wide, 12-round unanimous decision. Lemieux made his HBO and United States debut in headline fashion with a fantastic performance stopping top contender Gabriel Rosado in the tenth round on December 6 in Brooklyn, New York. The hard-hitting Lemieux is now a serious threat who will attempt to sweep and conquer the division with a win over Golovkin. Lemieux is poised to become the next king of the middleweight division and will look to give Golovkin the first loss of his professional career on Oct. 17. For fight updates on GOLOVKIN VS. LEMIEUX via social media, follow on Twitter and Instagram at @GoldenBoyBoxing, @HBOBoxing, @GGGBoxing, @LemieuxBoxing, @TomLoeffler1, and become a fan on Facebook at www.facebook.com/GoldenBoyBoxing and www.facebook.com/HBOBoxing along with www.facebook.com/GGGBoxing. Use the hashtag #GolovkinLemieux to join the conversation on Twitter. Also visit the websites www.HBOBoxing.com, www.GGGBoxing.com, www.eottm.com, and www.GoldenBoyPromotions.com for additional information. Previous Garcia looking to dazzle against Malignaggi tomorrow! Next Garcia and Malignaggi make weight!